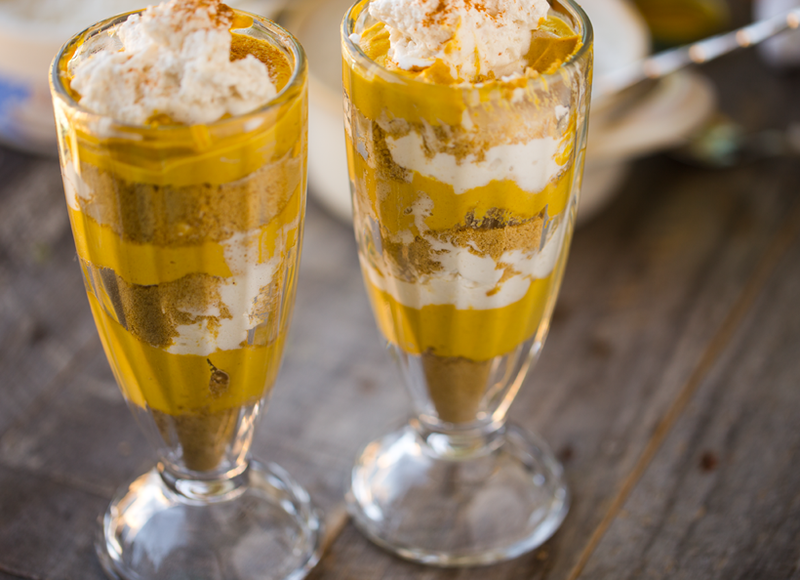 These Vegan Pumpkin Pie Parfaits are sooooooooo good. No, I'm serious. I devoured my test-run parfait and couldn't wait to share this recipe with you guys. These parfaits remind me of being a kid. 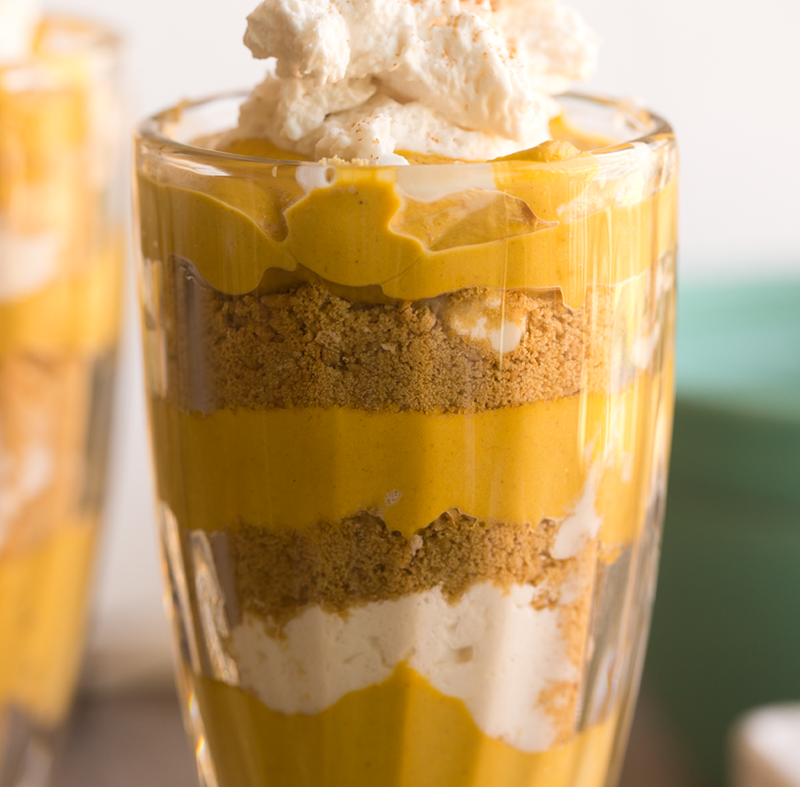 Maybe its the layers of gold, coconut whip and crumbly grahams. Maybe it is the spoon diving fun. Maybe it is the pumpkin pie flavor and texture. 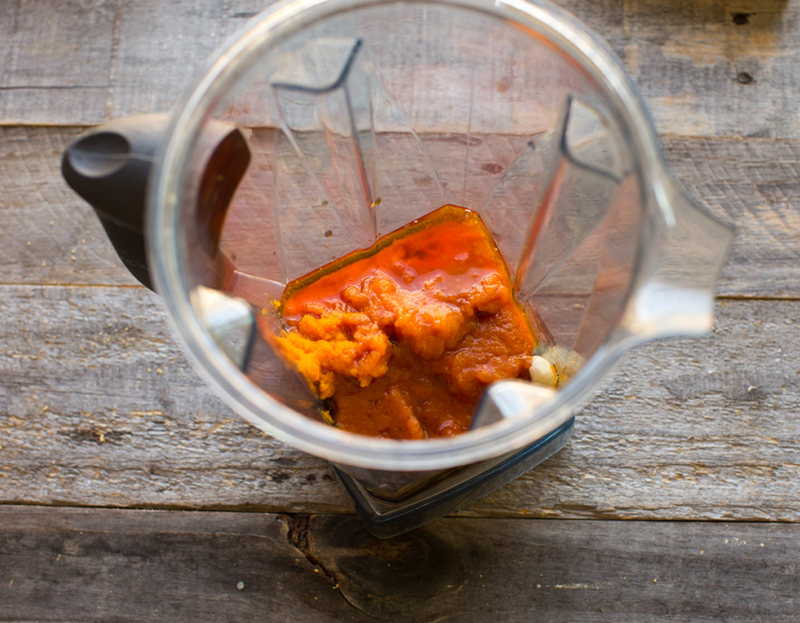 Whatever it is, I hope you give this recipe a try! 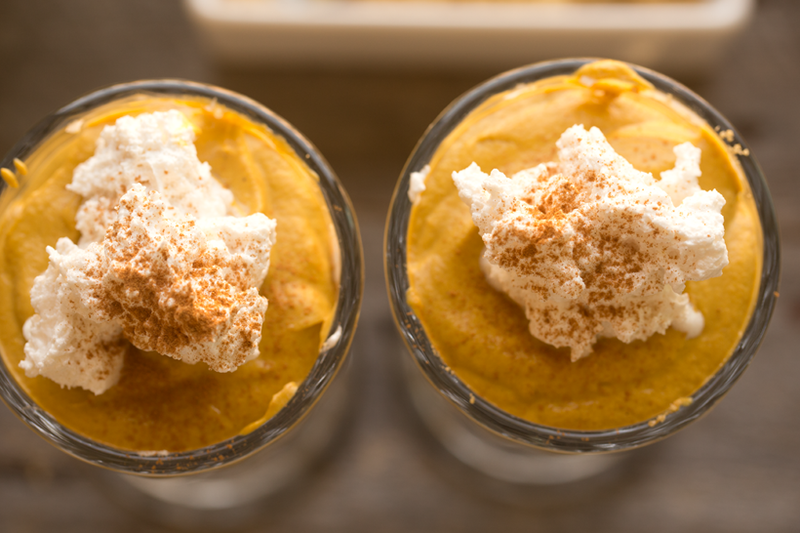 Have pumpkin pie bliss starting right now! No holiday required. And check out the video for this recipe too!.. Pumpkin Spice Kitty Cat. 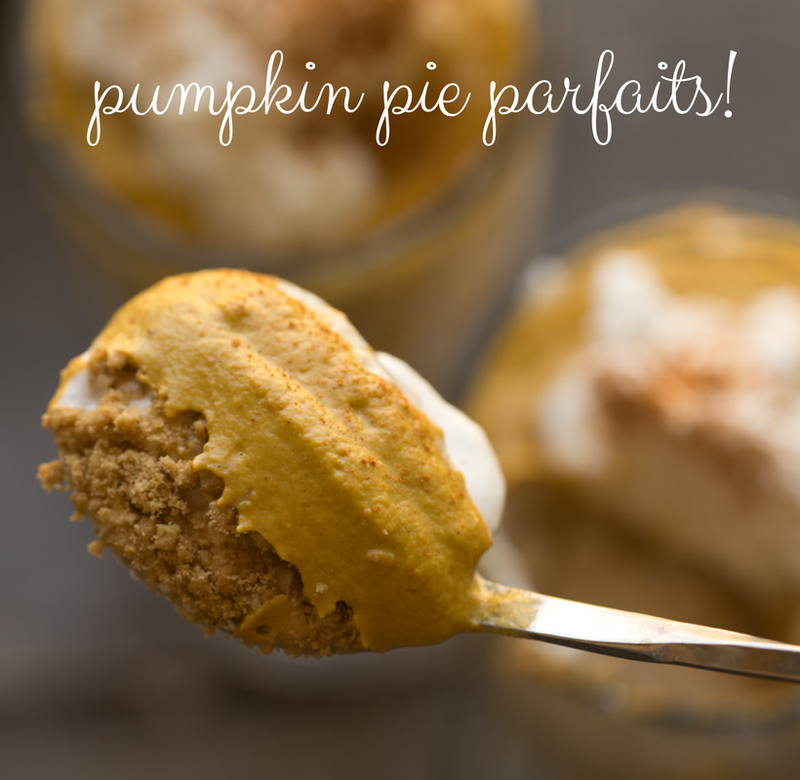 As I was making the video for this recipe I spilled a brand new bottle of pumpkin pie spice on the floor. About half the bottle came tumbling out, leaving an aroma of fall magic in the air. Carelessly, I decided to clean it up "in a few minutes." About an hour later when the kitties finally woke up from their afternoon nap and when I was cleaning the dishes up in the kitchen, I look over and there is sweet little MrWhite kitty cat, bottom first, obliviously sitting smack dab in the middle of the pumpkin pie spice bottle, looking out the window at the world below. "Birds. Hm." He thought to himself. "Mr White!" I shouted and ran towards him as he looked at me like I was nuts. Which is a look he gives me about a hundred times a day, btw. He sat up and hid under the table, wondering why I was flapping my arms his way. I scooped him up and found that his entire bum was COVERED in pumpkin pie spice, all golden and shiny against him black fur. Luckily my husband had just gotten home from work and together we cleaned him up, no trace of spice left. MrWhite was very confused. But ok, he did smell a little like pumpkin pie still. And now I don't just call him "pumpkin." His new nickname is "pumpkin spice latte." Poor kitty cat. Poor little PSL. This recipe is so good! I seriously could not stop diving my spoon into this parfait glass. 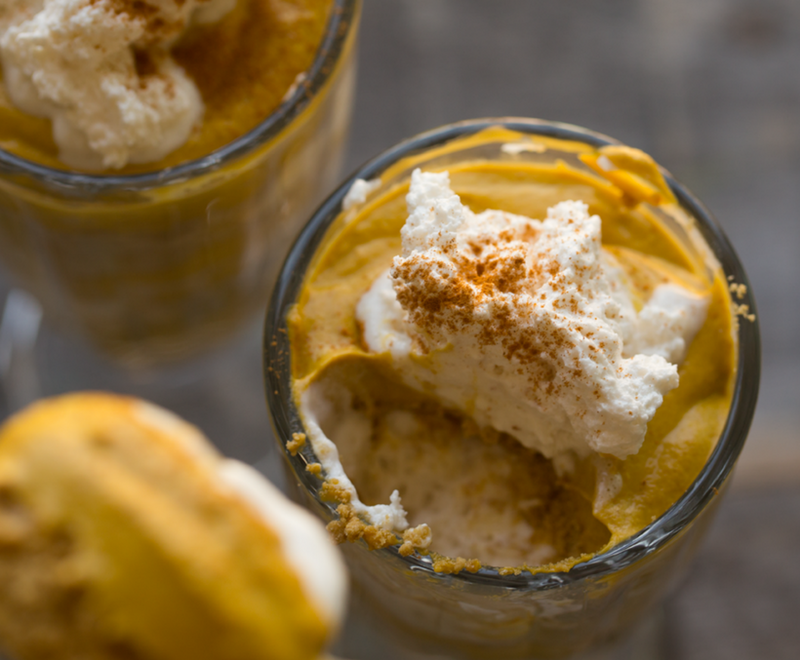 The spiced pumpkin pie pudding, coconut whip and finely processed grahams all nestled in a tall parfait glass in pretty layers, flavors of cinnamon and vanilla. Fall dessert, vegan, amazing. Start off by soaking your cashews overnight in water. 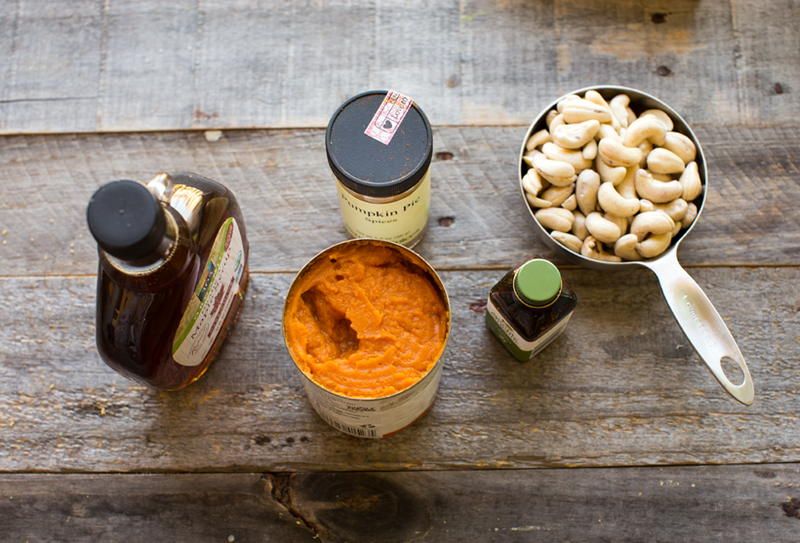 You will want to soak a little under 1 cup cashews since cashews tend to swell as they soak. 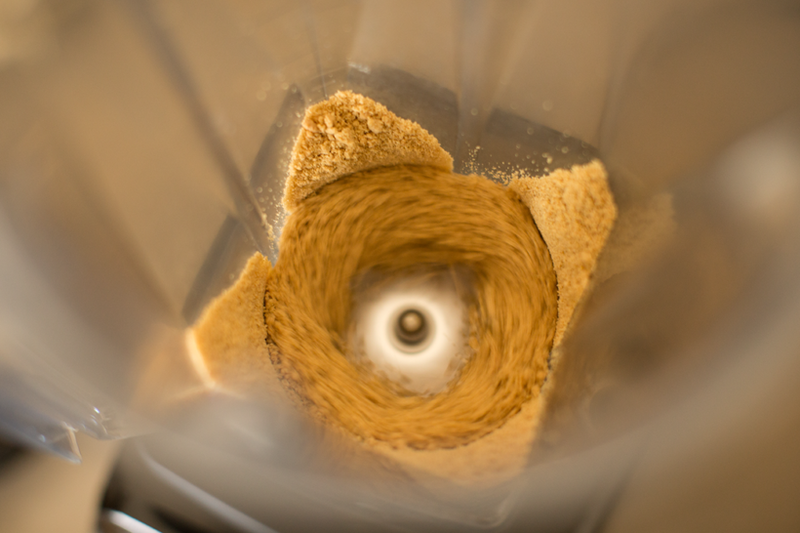 Process the graham crackers or cookies into a fine powder. I used a vegan and gluten free graham cracker. 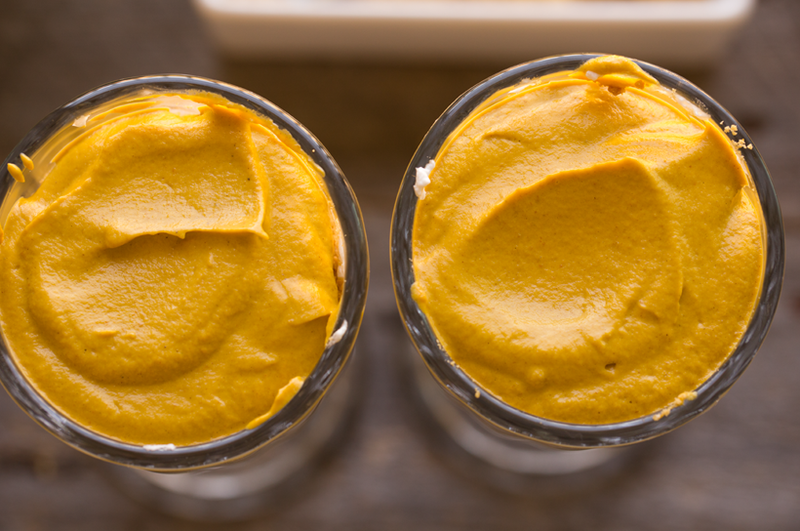 Make your pudding: Add the pumpkin, cashews, vanilla extract, pumpkin pie spice, maple syrup (or another sweetener like Medjool dates or coconut sugar) and optional salt. 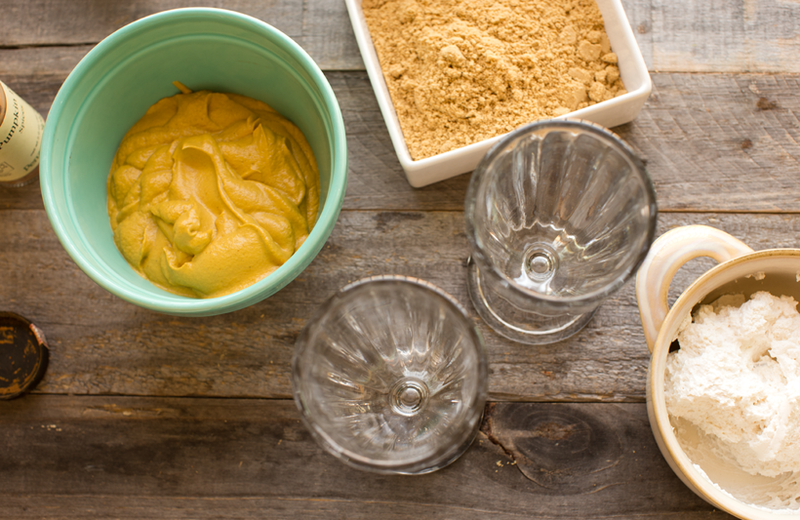 Blend your pudding mixture for a few seconds in a high speed blender, then start adding in some non-dairy milk as needed to blend. I added about 3/4 cup almond milk. 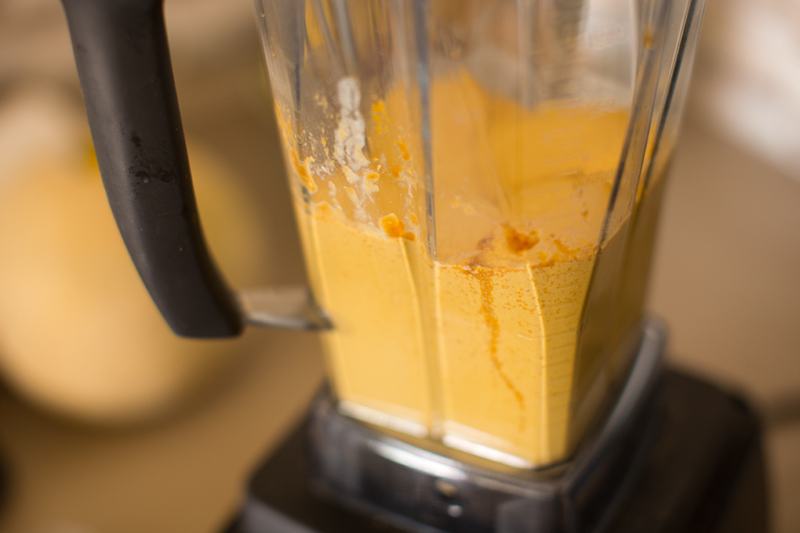 You want a creamy consistency that is as thick as possible, with still blending smoothly. Pour the pudding into a side bowl. 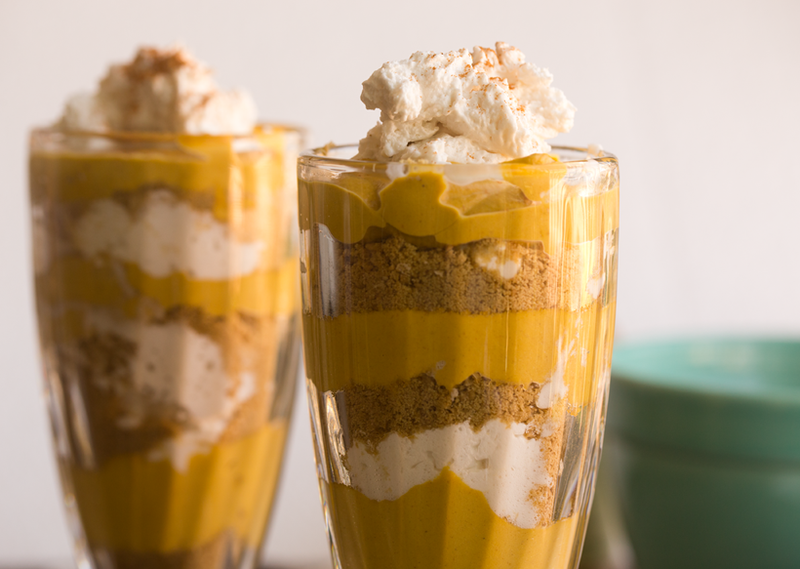 Start assembling the parfaits by layering the crumble with the pudding and coconut whip. 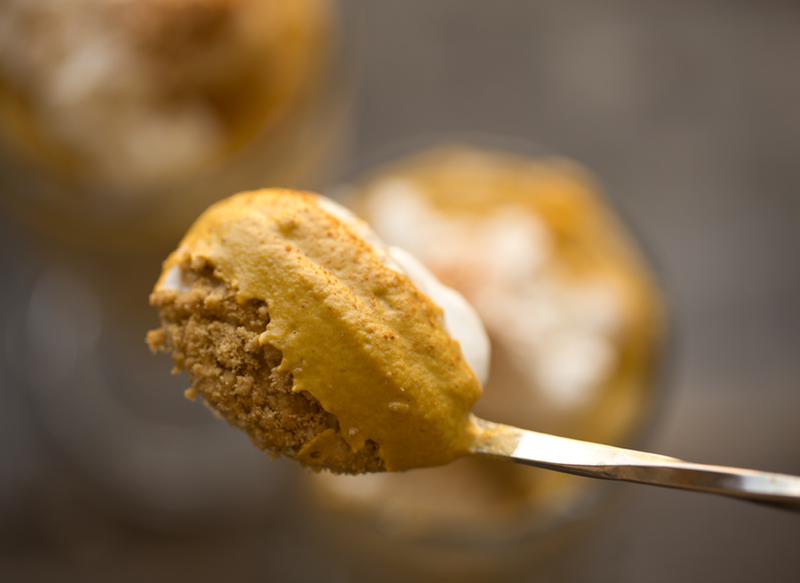 Top with whip and a sprinkle of pumpkin pie spice or cinnamon. Parfaits are best when chilled, though you could also eat them right away. I like to chill my parfaits for at least four hours or overnight before serving. Perfect make ahead dessert!